This year my company decided to have a Holiday Dessert contest. 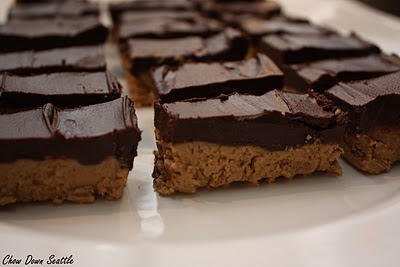 I had recently came across a recipe for some Chocolate Peanut Butter Bars, so I decided to give them a try. They turned out pretty good. This is a very simple recipe. Melt 1/2 cup (1 stick) of the butter in a medium saucepan over low heat. Remove from heat and stir in peanut butter, powdered sugar, and graham cracker crumbs. This will make a stiff dough. Spread dough in a lightly greased 9x13 inch pan. Press down evenly. Melt the remaining 1/2 cup butter over low heat. Add chocolate chips and keep heat very low. When chocolate is soft, stir gently. Continue heating until lumps are all melted. Stir, and then spread this mixture over the peanut butter layer. Refrigerate for 30 minutes, then cut into squares. Store in the refrigerator. Just a little follow-up to this post. My Chocolate Peanut Butter bars came in 3rd place out of 17 desserts at the office Holiday Party!